Here are some resources that we think you'll find valuable. 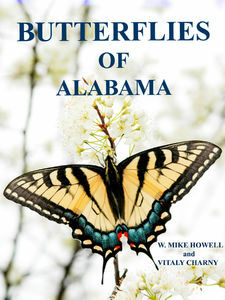 Howell, W. Mike and Vitaly Charny, Butterflies of Alabama, Pearson Learning Solutions, 2010. Ogard, Paulette and Sara Bright, Butterflies of Alabama: Glimpses into Their Lives, The University of Alabama Press, 2010. Allen, T. J. The Butterflies of West Virginia and Their Caterpillars. Pittsburgh: University of Pittsburgh Press, 1997. Belth, Jeffrey E., Butterflies of Indiana: A Field Guide, Indiana University Press, 2012. Brock, Jim P., and Kenn Kaufman. Butterflies of North America (Kaufman Field Guides). Boston: Houghton Mifflin Company, 2003. Cech, Rick, and Guy Tudor. Butterflies of the East Coast: An Observer’s Guide. Princeton, N.J.: Princeton University Press, 2005. Comstock, John Henry, and Anna Botsford Comstock. How to Know the Butterflies. New York: D. Appleton and Company, 1913. Daniels, Jaret C. Butterflies of the Carolinas: Field Guide. Cambridge, MN: Adventure Publications, Inc., 2003. Daniels, Jaret C. Butterflies of Florida: Field Guide. Cambridge, MN: Adventure Publications, Inc., 2003. Emmel, Thomas C. Florida’s Fabulous Butterflies. Tampa: World Publications, 1997. Feltwell, John. The Natural History of Butterflies. New York: Facts on File Publications, 1986. Glassberg, Jeffrey. Butterflies through Binoculars: The East (Butterflies through Binoculars Series). New York: Oxford University Press, 1999. Glassberg, Jeffrey, Marc C. Minno, and John V. Calhoun. Butterflies through Binoculars: A Field, Finding, and Gardening Guide to Butterflies in Florida (Butterflies through Binoculars Field Guide Series). New York: Oxford University Press, 2000. Harris, Lucien, Jr. Butterflies of Georgia. Norman: University of Oklahoma Press, 1972. Holland, W. J. The Butterfly Book. New York: Doubleday, Page and Company, 1898. Klots, Alexander B. A Field Guide to the Butterflies: North America East of the Great Plains (Peterson Field Guide Series). Boston: Houghton Mifflin Company, 1951. Miller, Jeffrey C., Daniel H. Janzen, and Winifred Hallwachs. 100 Butterflies and Moths. Cambridge, Mass. : The Belknap Press of Harvard University Press, 2007. Minno, Marc C., Jerry F. Butler, and Donald W. Hall. Florida Butterfly Caterpillars and Their Host Plants. Gainesville: University of Florida Press, 2005. Monroe, James L., and David Wright. Butterflies of Pennsyvania: A Field Guide. Pittsburgh: University of Pittsburgh Press, 2017. O’Donnell, Jane E., Lawrence F. Gall, and David L. Wagner, eds. The Connecticut Butterfly Atlas. Hartford, Conn.: State Geological and Natural History Survey, 2007. Opler, Paul O., and George O. Krizek. Butterflies: East of the Great Plains. Baltimore: John Hopkins University Press, 1984. Opler, Paul O., and Vichai Malikul. A Field Guide to Eastern Butterflies (Peterson Field Guide Series). Boston: Houghton Mifflin Company, 1992. Schappert, Phil. A World for Butterflies: Their Lives, Behaviour, and Future. Buffalo: Firefly Books, 2000. Scott, J. A. The Butterflies of North America: A Natural History and Field Guide. Stanford: Stanford University Press, 1986. Scriber, J. Mark, Yoshitaka Tsubaki, and Robert C. Lederhouse, eds. Swallowtail Butterflies: Their Ecology and Evolutionary Biology. Gainesville, Fla.: Scientific Publishers, 1995. Scudder, Samuel Hubbard. Everyday Butterflies: A Group of Biographies. Boston: Houghton, Mifflin and Company, 1899. Shull, Ernest M. The Butterflies of Indiana, Indiana Academy of Science, 1987. Schweitzer, Dale F., Marc C. Minno, and David L. Wagner, Rare declining, and poorly known butterflies and moths (Lepidoptera) of forests and woodlands in the Eastern United States, Morgantown, WV: U.S. Forest Service, Forest Health Technology Enterprise Team. 2011. Tveten, John, and Gloria Tveten. Butterflies of Houston and Southeast Texas. Austin: University of Texas Press, 1996. Tyler, Hamilton A. Swallowtail Butterflies of North America. Healdsburg, Calif.: Naturegraph Publishers, 1975. Wagner, David L. Caterpillars of Eastern North America : A Guide to Identification and Natural History (Princeton Field Guides). Princeton, N.J.: Princeton University Press, 2005. Bartlett,Amy. Peterson First Guide to Caterpillars of North America. Boston: Houghton Mifflin Harcourt, 1998. Datnow, Claire. The Adventures of the Sizzling Six: Monarch Mysteries. Birmingham: Media Mint Publishing, 2014. Forey, Pamela and Cecilia Fitzsimons. An Instant Guide to Butterflies. Avenal, New Jersey: Crescent Books, 1987. Lutman, Loretta. The Ugly Caterpillar: A True Story. The Butterfly Place, 2010. Mitchell, Robert T. and Herbert S. Zim. Butterflies and Moths: A Guide to the More Common American Species (A Golden Guide from St. Martin’s Press). New York: St. Martin’s Press, 2002. Opler, Paul. Peterson First Guide to Butterflies and Moths. 2nd ed., Boston: Houghton Mifflin Harcourt, 1998. Bright, Sara, Vitaly Charny, Mike Howell and Paulette Ogard. " Butterflies: New Records for Alabama." The Journal of the Alabama Academy of Science 84.1 (2013):37-42. Calhoun, John. "Long-lost holotypes and other forgotten treasures in the Ralph L. Chermock collection, with biographical notes." News of the Lepidopterists' Society 57. 2 (2015): 80-85. Charny, Vitaly. "Aberrations in Alabama Butterflies." Southern Lepidopterists' News 40.2 (2018): 84-86. Ogard, Paulette and Sara Bright. "Butterflies of Alabama: Glimpses into Their Lives Given to Schools." Southern Lepidopterists' News 36.4 (2014):177. The Common Butterflies of Alabama poster includes photographs of 50 butterfly species labelled with their common and scientific names. It was produced by Legacy: Partners in Environmental Education in 2009 and is a wonderful FREE resource! 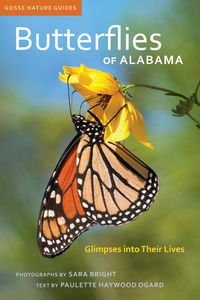 To order, visit the Legacy website at: http://legacyenved.org/product/common-butterflies-of-alabama/. The Alabama Butterfly Atlas (ABA) collects, interprets, and shares information about Alabama's butterfly populations for the purpose of education and conservation.